The 2019 V60 T6 AWD Inscription is long and sleek, smooth and fast. 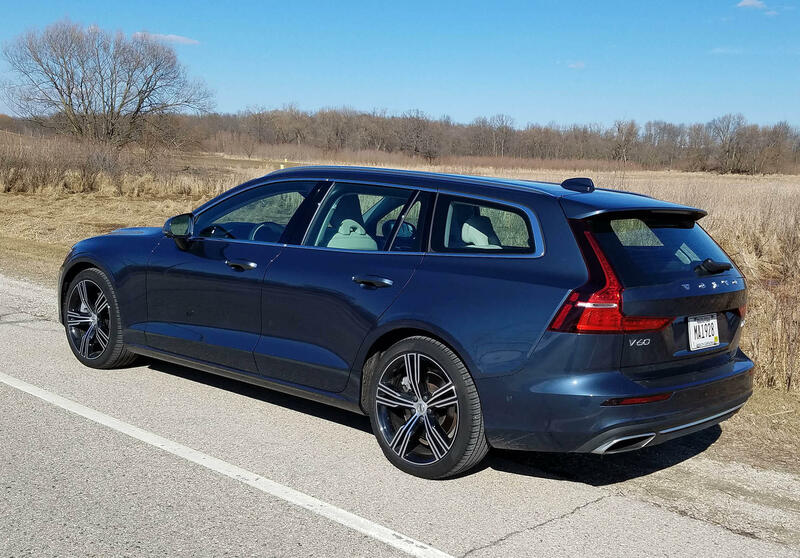 Something strange happened as I was testing Volvo’s new wagon, the V60. People waved and gave me an approving thumbs up. "Awesome car," a young man yelled to me at the gas station. I remind you, this is a wagon. Is it possible we've started to tire of minivans and look-alike crossovers? One can hope. One also may hope that more car makers decide to give their cars enough style to make us look, and linger a moment. Volvo has done just that, and bravo to their designers. This new V60 T6 AWD Inscription is long and sleek, an eye-catcher. It looks smooth and fast, and guess what? It is. While the base V60 T5 touts a turbocharged 2.0-liter 4-cylinder that creates 250 horses, the Inscription model goes one better. It adds a supercharger to the already turbocharged four-cylinder, boosting power to 316 horses. The result is instant power (no turbo lag) and strong power throughout the rev range. This feels like a sophisticated sport sedan, not a hefty wagon. The V60 is fun to drive, to rail down a highway onramp or just tap the accelerator to boost it past a slow truck or inattentive cell phone user on the freeway. Volvo delivers three drive modes too — Eco, Normal and Dynamic — that a driver can adjust via a roller button on the console. Plus, the 8-speed Geartronic transmission seems to perfectly mate with the power here for seamless shifting. Normal is fine in 90 percent of all driving, but Dynamic boosts power and is fun to engage on occasion. However, it stiffens the handling and ride more than most will need. Handling is fairly light and easy but precise, as you’d expect in a luxury sport sedan. It’s easy to turn into corners at speed and the all-wheel-drive system keeps its wheels planted even in slippery conditions. Ride is near luxury too, but with a sporty firmer feel than you might expect in a Volvo. A few large bumps stirred the interior a bit, but mostly the ride is well controlled and smooth. Dynamic mode though will turn many potholes into bigger annoyances. Best to use Dynamic only on highways, which tend to be a bit smoother. Additionally, the test car had a Four-C Active Chassis (for an extra $1,000). This allows the driver to select Comfort, Sport or Advanced to further smooth or stiffen the shock system. Both Sport and Advanced aid in limiting roll and sway in corners. If you plan to race your wagon, this seems a wise option. 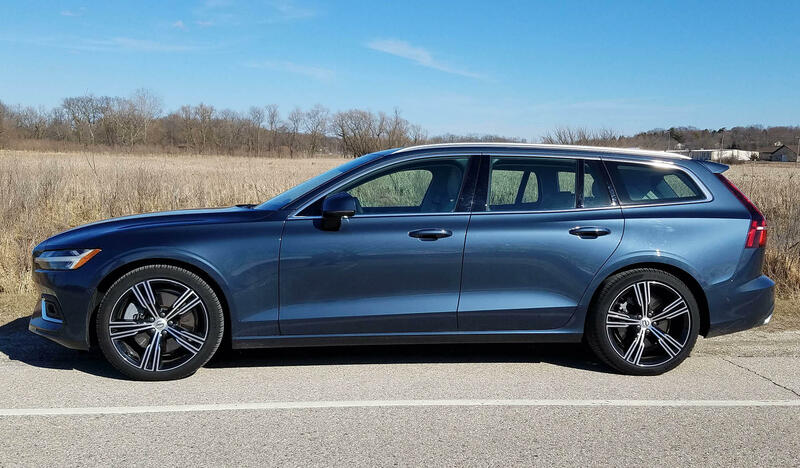 Inside, the sporty Denim Blue Metallic ($645 extra) test car, Volvo creates a luxurious interior that easily can make you forget you’re strapped into a wagon. The front seats can be heated and cooled. Inside is a black over tan (cream, really) dash with driftwood inlays (standard Inscription trim), and a jeweled satin chrome look around the dash’s air vents, door releases and snazzy stereo speaker faces in the doors. There is wood trim atop the console and gloss black trim by the start knob on the console. Seats are a creamy perforated leather. Thanks to a $2,000 luxury seat package, these seats are special. Not only are they well shaped with excellent back support, the package adds Nappa leather, power side bolster support and a massaging feature you adjust through levers on the seat bottom’s side and visualized on the large iPad-size touchscreen in the dash’s center stack. The 10-way power front seats are heated and cooled too, and the driver’s seat has a power lower cushion that can be extended for long-legged drivers. That’s part of the massive $6,000 Inscription package. Rear seats also are heated, as is the two-tone leather steering wheel, a combo that costs $750. Everything is easy to see and read here, plus there’s a head-up display to aid the driver. It’s part of a $2,500 Advanced Package. More on that in a second. Everyone would like the Volvo’s nearly 13-inch tall touchscreen for its visibility. However, the Sensus navigation system and touchscreen are simply hard to use while driving. You not only must precisely press the buttons for radio stations and other commands, but to reach all the safety features — lane departure, parking sensors and so on — a driver needs to swipe the screen to move it left or right to access the functions. The navigation system and touchscreen are handy, but they're difficult to use while driving. All that is a hassle as you drive, and even setting the climate control temps, or adjusting the seat heat/cool functions and steering wheel heat, require tapping the screen repeatedly. Sometimes it reacts, and sometimes (especially when the car is first started) reactions are delayed. So, fire up the car and sit and wait for all the electronics to boot up before you can click on the seat heat. Not great in cold weather. 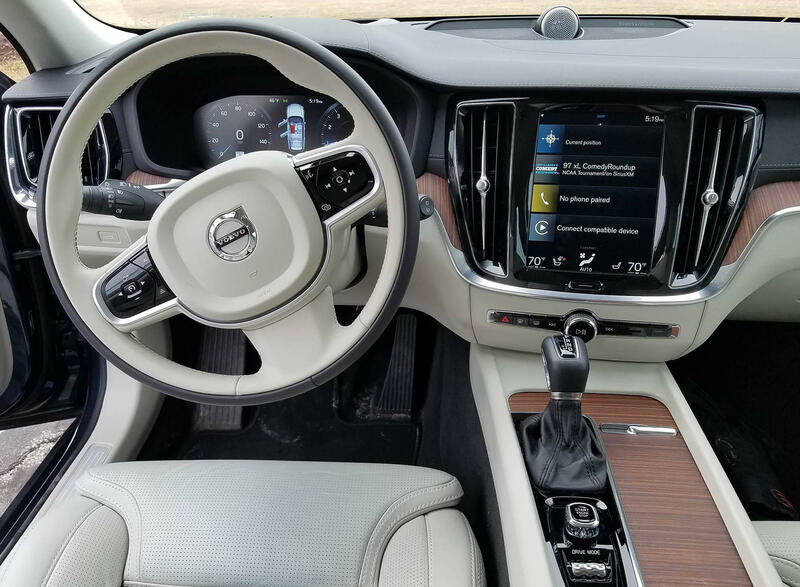 If you can move beyond the touch/slide screen, the Volvo has plenty to like inside, including a giant sunroof, HomeLink system, power tailgate and even a cooled glovebox with the Inscription package, so you can keep a beverage cool on a trip. The $6,000 package also adds a 600-watt Harman Kardon sound system with 14 speakers. Although that wasn’t good enough for the test car, it added a $3,200 Bowers & Wilkins premium sound system, which did sound great. Of course there are the standard safety devices, but controlled through the big screen, including blind-spot warning, cross-traffic alerts, parking sensors and lane departure. The lights here have bending beams to shine around corners as you turn and even retractable side rearview mirrors so you can fold them close to the car’s body in tight parking spots. That Advanced package also includes a high-pressure headlight cleaning system, a 360-degree camera view and those fancy bending headlights. Plus, a Pilot assist semi-autonomous driving system tied to the cruise control to help keep you in your lane and automatically brake to avoid slower moving vehicles or other obstacles. The Inscription comes with 18-inch tires and spiffy 10-spoke wheels. The Inscription comes with 18-inch tires and spiffy 10-spoke wheels. But the test car upgraded to 19-inchers with similar Inscription alloy 10-point wheels for another $800. While the cargo room in back is nowhere near that of many crossovers and SUVs, it’ll hold plenty at 23.2 cubic feet. Fold down the rear seat and that grows to 50.9 cubic feet. Volvo’s V60 also likes to drink premium gas, but mileage was respectable in my mix of about 60 percent city and 40 percent highway driving. I got 22.8 mpg, while the EPA rates this at 21 mpg city and 31 mpg highway. Then there’s price. The test car started at $44,395, including delivery — a competitive price considering the performance and high-end looks and interior trim. But this one loaded itself up with extras, especially that Inscription package at $6,000. So the final price was $61,480. Certainly, there’s not much more you’d want on a car at that price. Still, if you don’t mind sacrificing some of the sporty performance while still getting great looks, along with a sporty handling and riding wagon, then the T5 Momentum model at about $39,000 is worth a look. Even moving up to the T5 R-Design with a few more goodies keeps the car just below $44,000. So, good looks and functionality, with a bit less luxury, are available at a reasonable price. And who ever thought a Volvo, no matter the price, would be getting envious stares at stoplights? Hits: Beautiful sculpted exterior, sport sedan handling and power, good ride and AWD. 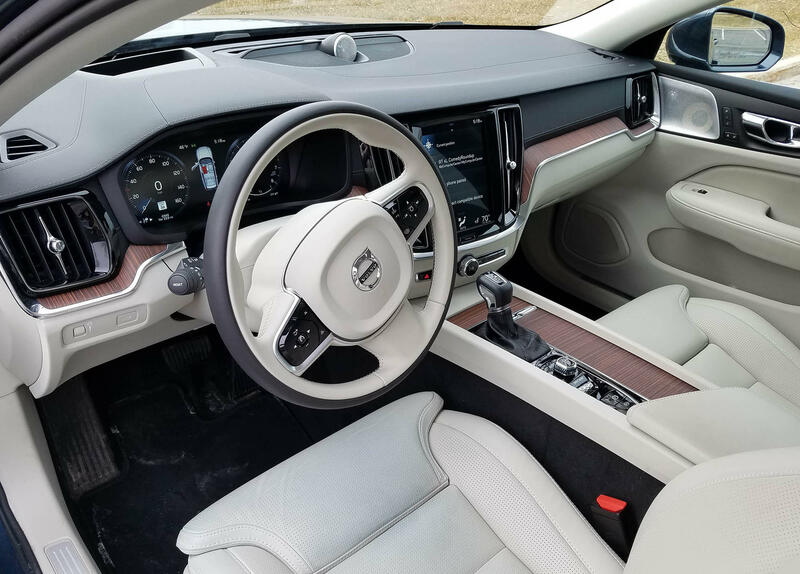 Three power modes, giant sunroof, heated/cooled front seats, heated rear seats, heated steering wheel, extra-supportive power seats w/massage function, two-tone leather wheel, power tailgate, bevy of safety devices and big touchscreen. Misses: Touchscreen too complex to easily use while driving, awkward access to seat and steering wheel heat via screen, delay in screen accepting commands, safety equipment adjustments all via screen, suspension too stiff in Dynamic mode, and wagon drinks premium fuel. Editor's note: Mark Savage's auto review column, Savage On Wheels, looks at a new vehicle every week and tells consumers what’s good, what’s not so good, and how the vehicle fits into the marketplace. The sedans are nearly identical in size now, the Altima actually having a longer wheelbase than the Maxima, which used to be the larger of the two. Overall length is just a hair from identical and weight is similar too.